The sassy, media loving AI ‘Murderbot’ returns in Exit Strategy, the final novella in The Murderbot Diaries. Murderbot first burst on to the scene in 2017’s All Systems Red. In that first installment, Murderbot was hired as a security unit (SecUnit) to protect a team of scientists lead by a Dr. Mensah from the mysterious GrayCris Corporation. Dr. Mensah ultimately became the first human to treat Murderbot like a person. Having secretly hacked its governor module, Murderbot chose to go out on its own rather than stay behind with its newfound friends and play by the rules of human society any longer. Having had its memory wiped by GrayCris after a murder spree, Murderbot made it a mission to find out what happened the night of the murders. Exit Strategy picks up after Murderbot returns from an abandoned terraforming project (in the third volume, Rogue Protocol) once run by GrayCris, the evidence it was looking for proving illegal activity by GrayCris in its grasp. Hoping to take the evidence to Dr. Mensah, Murderbot discovers she has been kidnapped by GrayCris, likely due to the idea that she sent Murderbot on its mission to uncover their secrets. Reunited with the team from its first adventure, Murderbot attempts to rescue Dr. Mensah in a final showdown with GrayCris. And it felt so weird to be talking to a human like this, a human who knew what I was. I didn’t have to force myself to stare at Pin-Lee’s face, worry that my expressions were normal. Abene had known I was a SecUnit, but she hadn’t known I was me. 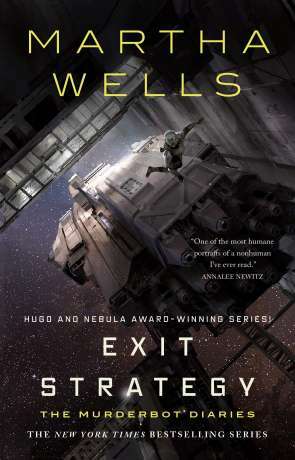 In writing The Murderbot Diaries, Wells has created a unique character within the science fiction genre, an outsider of sorts who has to make its way through the human world and coexist. Murderbot is, if nothing else, a funny narrator to spend an afternoon with and is highly enjoyable. With All Systems Red having won the Hugo Award for Best Novella, and its three sequels being released in 2018, the 2019 Hugo Awards race should be a tight one. A recent announcement regarding a full length novel starring Murderbot is also an exciting prospect. Written on 5th October 2018 by Michael Feeney.